The latest trend to sweep the fashion world? Mustaches. 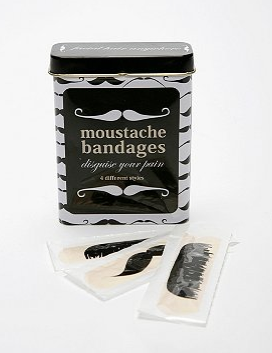 Quirky, whimsical and super fun -- the manly mustache is popping up on T-shirts, jewelry, even bandages! (Just look at these super cute Urban Outfitters Moustache Socks for proof.) Check out some of the best mustache fashion after the jump. One of the most fun graphic tees I've yet to come across. Well, if this isn't just the most adorable glasses holder I've ever seen! Your change has never looked so cute. Doesn't this necklace make you think of the gingerbread man in Shrek? Love the beaded eyes. Getting hurt is never fun, but at least slapping one of these bandages on your latest owie will put you in a better mood. 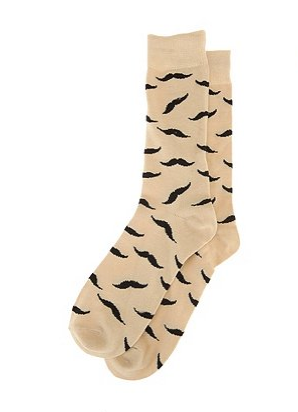 The mustache goes glam! Two gold vermeil mustaches -- one with a white sapphire bezel -- hang from a gorgeous twisted chain.